Mercury's extreme temperatures and lack of an atmosphere would make it very difficult, if not impossible, for people to live on the planet. Editor's note: Have you ever wondered what it might be like to homestead on Mars or walk on the moons of Saturn? So did we. This is the first in Space.com's 12-part series on what it might be like to live on or near planets in our solar system, and beyond. Check back each week for the next space destination. Conditions on Mercury would make living there a challenge. See how in this Space.com infographic. 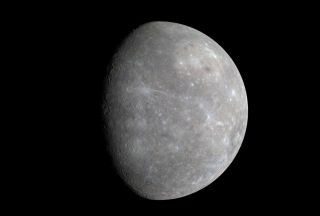 Mercury is about two-fifths the size of Earth, with a similar gravity to Mars, or about 38 percent of Earth's gravity. This means that you could jump three times as high on Mercury, and heavy objects would be easier to pick up, Blewett said. However, everything would still have the same mass and inertia, so you could be knocked over if someone threw a heavy object at you, he added.